Why is it important to schedule your next appointment before leaving our office? We have added a new blog! 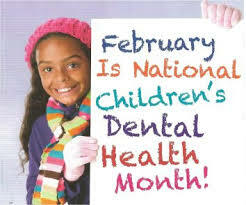 Children's Dental Health Month is celebrated each February to raise awareness about the importance of oral health. Developing good habits at a young age along with regular dental visits will help children to have lifelong healthy teeth and gums. This is important for every child from the first tooth to a full set of adult teeth. The ADA recommends that parents take children to a dentist no later than their first birthday and then at intervals recommended by their dentist, but usually twice a year. Oral hygiene is especially important during orthodontic treatment! At your first appointment, our dental assistants go over hygiene instructions with you and your parents. Be sure to review the instructions and feel free to ask questions or talk to us about your concerns at your next visit. We know you get a lot of information at that first visit and it can be hard to concentrate on these instructions when you have a mouth full of new hardware! We understand this and will go over instructions with you again at your next appointment if needed.